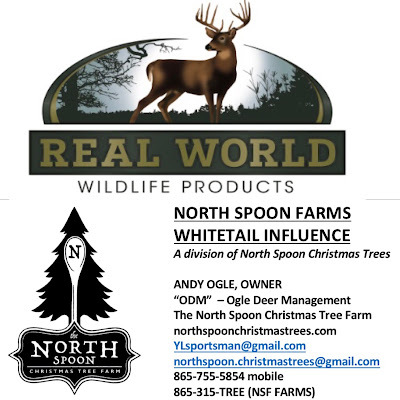 We are excited to announce some changes this coming year for North Spoon Farms! We have added to our repertoire a passion of our family's which is what we, behind the scenes, refer to as "ODM" or Ogle Deer Management - which, for our family, means our version of investing in the Whitetail Deer population and outdoor conservation efforts in and around our region in order to increase our outdoor experiences and encounters. If you are an outdoorsman or outdoorswoman and enjoy hunting or the acts of wildlife conservation and management, you, too will get this endeavor! Our Christmas Tree business and dream is well on its way to healthy growth and good establishment in East Tennessee; Christmas Trees will be our priority as a Christmas Tree Farm and local business moving forward...and now we are adding what we call, North Spoon Farms: Whitetail Influence a division of North Spoon Christmas Tree Farm. The above companies and their products are accessible through NSF because of Young Life Loudon County & Bent Brow Outdoors! Please help us welcome these quality companies and their products to the North Spoon Farms family. We hope you will take advantage of all we are offering. As always, Merry Christmas & High Hopes to you.